Thrasher's Blog: One Star Hotel's "Good Morning, West Gordon"
One Star Hotel's "Good Morning, West Gordon"
Over on songs:illinois MP3's from One Star Hotel's newest release Good Morning, West Gordon. 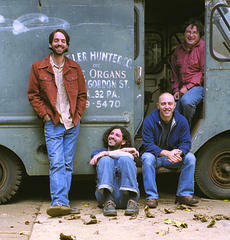 "This Philadelphia band name drops Flaming Lips, Neil Young, Wilco and Big Star." Good stuff. Check out the track "Frustrated and Free" with it's fine little feedback meltdown and see who's sound it reminds you of.